Controlling a society is not an easy task. It is about controlling food production means, limiting the mobility of people, denying access to everything, allowing basic human rights to be violated by the uniformed corps (very important because these groups have weaponry), and allowing irregular gangs take over resources that, otherwise, they would never be able to have control of. Therefore, they NEED desperately to make people knee, and one of the ways they can do it, is via the control of the circulating money. This is nothing new. The original Rothschild said once “give me the control of the currency of a country, and I wouldn´t mind who governs it”. Or something like that. That is exactly what this mafia has done. To do so, the criminal gang in power has reinforced their strategy. 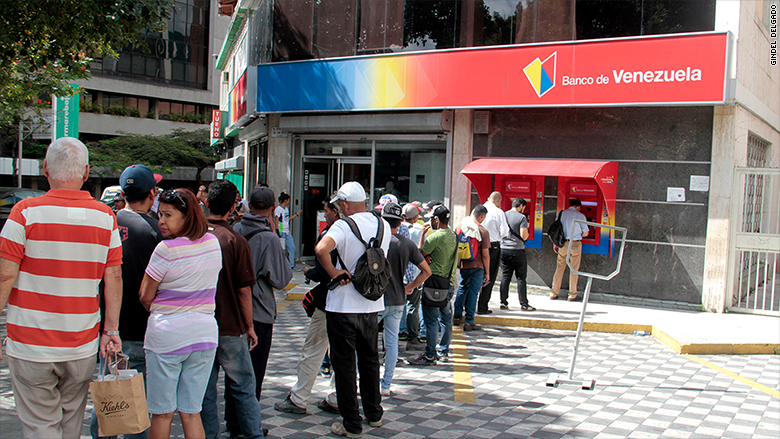 They are freezing bank accounts inside Venezuela, in our national currency, if they detect someone is using the account from another country. My own bank accounts, with over 15 years of history, included. This is against the right to use the private and personal property, guaranteed in our Constitution. They want so eagerly to change and seize our private property, just like Cuba did. Sending money back to family is not an easy task. There is an entire underground economy that works receiving money in foreign currency in accounts overseas and exchanging national currency in a circular flow because the bolivar is not exchangeable for some other currency. The last steps to instate totalitarianism definitely, are now slowly being taken: the financial infrastructure is being stormed with greater intensity these days. Let’s make this clear. Since the beginning of the takeover, when everyone was charmed by the Uncle Hugo´s charisma, without any clue about what was going on under the table (things like Alejandro Andrade being in charge of the National Treasury, ”assigned” personally by Hugo), this was the plan. The subjugation of any private initiative in the financial world. “The state must control everything” is the communist motto in Venezuela. The “empire” (sounds familiar?) is ready to “attack us” because they “need our resources”. Funny. Those stealing our gold and coltan are Russia, China and Turkey. I can´t see any other nation around. But controlling 20 million persons without any popularity, regardless of the number of armed soldiers, is not an easy task. After controlling access to food, medicines and some other basic life necessities, the following is to seize the ability of people to dispose of their money as they please. By doing so, they increase as much as their control level, as the stress on the people they need to distract. And this stress is exactly what they want. By controlling the amount of who transfers to whom, when and where…well, they could use to put in prison ANYONE THEY WANT.As a matter of fact, the reason they don’t do it just because they don’t have the facilities to lock down so many people. But the attempts to convert the country into a police state just like East Germany is there. The recent creation of the Migratory Police is just another indication. The worst thing is, that it is going to be a tropical version, with the consequent favoring of the criminals, and the repression and harassing of regular, decent citizens who are exposed to being kidnapped or stolen. Upon controlling the money flow, they could strangle any entity that is opposed to the totalitarian state. Of course, this is not a specialty of the communist world. This is known to happen in the western world too. Hollywood and Wall Street are no exceptions. At this point in our lives, we all should be aware of what seems to be happening beneath the surface. Here’s how they justify blocking the bank accounts. Of course, they justify blocking the bank accounts, especially in the state-owned banking institutions, because they say they are “fighting terrorism”. Once the account is blocked, they will ask for some proof that the money comes from a legal transaction. Of course, the evidence is subject to their criteria. If they suspect that the origin of the money is suspicious, they will seize it and the account holder will be sent to the…”authorities”. If you can demonstrate that the money is legit, people usually can walk free. The organization in charge of the investigation of this things is the SUDEBAN, and they have strict orders to call the SEBIN, the intelligence corps being used as Praetorian Guard, to take care of the issue, and these are trained by the Cubans. So you know what that means already. All the stories you could have heard about what happened in Cuba, are happening now in my country. The Cubans imposed the Cuban convertible peso, a currency designed for limited usage within the country. The mafia tried to do something similar, with the technological improvement of the cryptocurrencies with the “petro”…but of course, there is not even the slightest indication of trust that favors anything coming from those thugs. Therefore, that “cryptocurrency” is useless. The entire purpose of that useless currency? Evading the sanctions generated by their defiant violation of our human rights for years. The iron fist over the financial infrastructure is executed in some instances using the intelligence services. Of course, there is a lot of business involving this: people with large accounts being…”released” after paying some…let´s say “fines”, and an adequate collaboration with the “authorities”. You know what I mean. There is a history of taking over entire industries to control the people. Of course, the blocking is not something that was improvised. Many years ago, Uncle Hugo had taken control of the Internet in Venezuela. He did this by seizing the largest private company of communications, the CANTV. Then, with the Ministry of Telecommunications providing to this (now) state-owned company the entire rights to be the only internet provider in the country (which is something). Now, they are using another institution to violate our rights over our private property, our financial assets, the money, with the SUDEBAN. This “institution” is supposedly in charge of the banking institutions, and establish the appropriate regulations for their functioning. Of course, the real intention is to control the information regarding the money flow. This is not unprecedented. Cubans could force their people into slavery because they did not have means to escape of the financial grip back then. The main idea behind this is to produce a slow asphyxiation of the trade, regardless if this is between commerce or private parties. They need to know what accounts are being used to bypass the currency control exchange so they can block them, and harass the people that are making business and trying to make a living outside the unreal conditions they want to force in the economy. The price fixation has resulted in a huge black market, with a very limited production controlled almost totally by a military mafia. All of this helps to keep the people busy and not rebelling. They have tried for years to impose a price for the dollar; but that price fixation is unreal, because you can´t go to ANYWHERE and buy dollars at the official exchange rate. The reason is simple: there are no dollars available because they stole every single dime that came into the country. The oil production is not enough to keep pumping dollars into the financial system that has become a gigantic laundry, under the regime terror that Rafael Ramirez instated as president of the oil corporation PDVSA. They are looking now for the extradition of Alejandro Andrade, the manufacturer of the financial infrastructure that allowed them to steal OUR money…BILLIONS of dollars. As a result, they are trying to screw the population as much as they can, because they know that, keeping them busy, they won´t get organized and start fighting them. You can´t train a rebel militia if your kids are starving, though. Of course, this is going to be the final result…perhaps a highly chaotic mass of people that will result in a huge snowball that will sweep the mafias, colectivos, and everything in the middle. There is nothing as powerful as the rage of millions of people. It is just a matter of time, and I know it. Of course, we ex-pats won´t be sitting around just watching. But for my own safety, I will leave this to the imagination of my fellow libertarians. They have suspended the access to “unofficial” exchange pages such as AirTM, and other similar ones. All of this is somehow by-passed, but I won´t give details here because of the harm it can do to those who try to send money there without recurring to the official exchange rate. It should be on the net, though, for those interested. The barter system is the only way to get by now. Rants apart (Jeez, that felt good J ), the idea is to use some kind of exchange or bartering system that can be used to level the playground, so to speak. Once achieved some kind of agreement, then some degree of stabilization is going to be present. For example, if I have a couple of brand new tires, that last for a couple of years of normal usage, perhaps I could ask for them engine oil enough to keep my own SUV running for that couple of years. Or, perhaps we could check the websites overseas and see the prices in some foreign currency, and adjust ourselves. However, that means a strong, person-to-person interaction, something that is unlikely to exist with a big shop or store. But here is where the ingenuity should prevail, and some special warehouses could be used very discreetly for such purpose (Mos Eisley, anyone?). I am pretty sure that, without the “authorities” harassing so much to the farmers and food producers or processors like they do in Cuba, things would be much easier. Thanks very much to those special persons that have been sending some assistance continuously, we appreciate that gesture, and we know it comes from the heart, and that is the best. Under the current circumstances, uncertainty about the date of our return is now greater…I only can hope, and try to organize some demonstrations around here, in an attempt to make the world not forget our tragedy. God bless us all, people!. Contributed by J. G. Martinez D. of The Organic Prepper. This entry was posted on December 26, 2018 at 8:50 am	and is filed under Uncategorized. Tagged: blocking bank accounts, instate totalitarianism, patriot act, Venezuela. You can follow any responses to this entry through the RSS 2.0 feed. You can leave a response, or trackback from your own site.